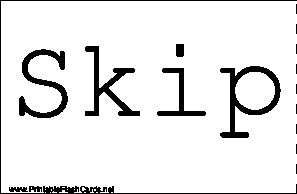 Skip Skipping is a series of step-hops done with alternating feet. 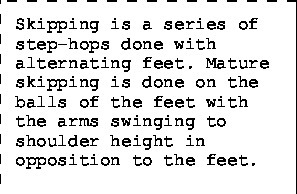 Mature skipping is done on the balls of the feet with the arms swinging to shoulder height in opposition to the feet. Leap Leaping uses an elongated step that takes off on one foot but land on the opposite. It is used to cover distance or to go over a low obstacle. Leaping should emphasize graceful flight through space. Run In contrast to walking, running involves a brief time when both feet are off the ground. Running varies from slow jog, to a trot, to a sprint. The head should be up with eyes looking in the direction of travel. Arms should not swing across the mid-line of the body. 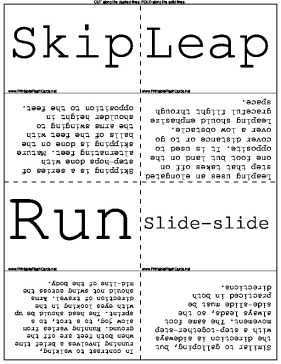 Slide-slide Similar to galloping, but the direction is sideways with a step-together-step movement. The same foot always leads, so the side-slide must be practiced in both directions. Hop Hoping is done on one foot at a time. The angle of the body, the other foot and the arms serve to balance the movement. 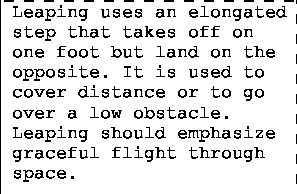 Hopping may be performed in 1 place or while moving. Gallop Face forward, lead with one foot, and bring the other up to it (step-together-step). The same foot always leads. Jump Jumping is taking off from 2 feet and landing on 2 feet. Swinging the arms helps with the upswing, and movement of the body combined with the force of the feet with knees bent. Jumping may be done in place (up and down) or forward, backward or sideways. Walk Toes point straight ahead, arms swing freely from the shoulders in opposition to the feet. Body is erect, eyes look ahead slightly below eye level. March A rhythmic walk accompanied by lifted knees and swinging arms.